Laboratory for Intelligent Systems and Manufacturing, led by Professor Haruhiko Suwa, is part of the Department of Mechanical Engineering at Setsunan University. The scope of our research includes: energy-efficient operations of manufacturing system, manufacturing intelligence, machinability of sintered carbaide tools, stability-directed planning, and proactive/reactive scheduling. Energy-awareness has been recognized as critical in industry to pursue sustainable manufacturing along with reduction of CO2 emission and the energy costs. In addition to the development of energy-saving solutions by both of the the top-down approach like factory energy management systems (FEMS) and the bottom-up approach associated with eco-suited machinng technologies, needs for much smarter and highly-automated manufacturing systems have been increased, therefore energy-awareness, not in manufacturing processes but energy-conscious planning must be considered. We focus on developing the smart way of enery-aware operations of manufacturing systems. This is a collaborative work with Prof. Moriwaki and DIJET Industrial. Tungsten Carbide have extremely high hardness and wear-resistivity, which is expected to be applied widly to dies and molds in the near future. We are focusing on developing an efficient machining method of Tungsten Carbide, and examining the machinability and some properties of CBN tools and also diamond-coated carbide cutting tools. This collaborative work with Dr. Morita at Takachiho University proposes a new framework for a stability-based decision making process in planning and scheduling, including builining a mathematical model and the development of effiient/high-speed methods with considering practical applications. The term "stability" refers to the higher predictability of a released plan/schedule and also signifies the robustness of the plan/schedule against internal and external uncertainties. In the past few years we have focused on the application of our idea to capacity requirement planning (CRP) in industry, and propsed a robust CRP method that we believe can generate a stable load plan against dynamic changes in a manufacturing environment. Suwa H and Morita D (2014) Stability-Based Short-Term Capacity Requirement Planning under Uncertainty, Procedia CIRP, Vol.19, pp.123-128. 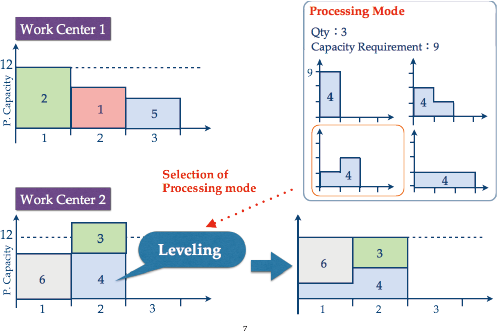 Morita D and Suwa H (2012) An Optimization Method for Critical Chain Scheduling toward Project Greenality, International Journal of Automation Technology, Vol.6, No.3, pp.331-337.